This year is the first year in a long time that we have broken a Christmas ornament. There were three casualties and one of them was a salt dough stocking ornament that I have had for as long as I can remember. If you are looking for a way to pack up some of your most fragile and memorable ornaments this year, check out this DIY ornament storage organizer. Create an insert for a normal plastic bin by hot gluing paper cups to a cardboard insert cut to fit your box. Then wrap the ornaments in tissue paper and place them inside the cups. 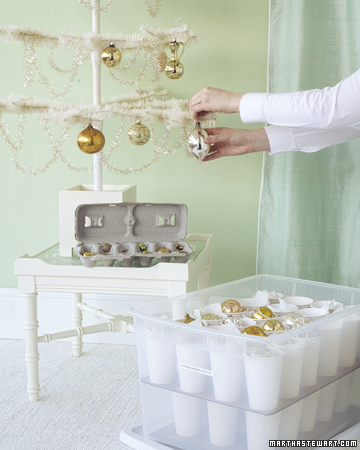 You can see how to store your ornaments safely over at Martha Stewart.